Georgia's leading exporter, Tbilisi Aerospace Manufacturing Company (TAM), a creation of 20th Soviet history, has been reborn over the past four years into a model for 21st Century post-communist commerce. The 2800 employee jet plane design, manufacturing and assembly plant, on the outskirts of Tbilisi, is largely the brainchild of one man, Dr. Pantiko Tordio, CEO and Board Chairman. TAM has a business plan that calls for diversification, privatization and rapid growth in the next few years. Founded in 1941, the Georgian government owned 100 percent of the shares of the company, but a privatization process was underway in 2002. In 2002 Tbilisi Aircraft factory became a Joint Stock Company Tbilaviamsheni. Today JSC Tbilaviamsheni employees about 2000 people. The Quality Assurance System of JSC Tbilaviamsheni is ISO 9001 certified. Operating now with two basic products, manufacture of a highly versatile jet attack aircraft and the overhaul and modernization of other jets, the company currently brings in more foreign revenue than any other Georgian firm. Two aircraft of the Sukhoi Attack Aircraft Concern (Sturmoviki Sukhogo in Russian) shown at a static display during the MAKS 2001 air show. The Su-39 (Su-25TM) had been displayed earlier and was well known, while the Su-25SM upgraded by the Air Force's 121st aircraft repair plant at Kubinka was shown for the first time. The modernization and repair are done at the same time. The 121st aircraft repair plant is capable of upgrading fifteen to twenty aircraft a year. The Air Force's 121st aircraft repair plant at Kubinka was chosen to be a production base because Sukhoi had disagreement with the production plant in Tbilisi (Tbilisi Aerospace Manufacturing, TAM). Vazha Tordia [Pantiko Tordia], Director General of the TAM, was ready to cooperate with Russia. But he focused on the upgrade variant that was exhibited in 2001 in Paris. Sukhoi made several attempts to set the modernization of the Su-25 at the TAM going, but failed to move beyond that point. Projects are underway with the Israeli firms ELBIT and ELGAD, to develop advanced navigation and weapons systems. Kelowna Flightcraft of Canada is a partner in a venture to modernize and overhaul the Convair 5800 aircraft, adding modules and fitting a new engine. Another TAM business in development involves unmanned multi-functional aerial vehicles, along with guidance, navigation and control systems. These planes would be used to control borders, natural resources, water ways and railways and for the surveillance of pipelines and electricity transmission lines. Also under development is a project with the ASCEND AIR, an American firm, to build two and six-seater aircraft for which there is a large market in the Caucasus region. Ascendair International is a full service worldwide aircraft company. Its specialty is assembling, adapting, and marketing various aircraft through its worldwide network of sales representatives. Ascendair products include the Viperjet and the CV5800, which are assembled in Tbilisi, Georgia (CIS) by Tbilisi Aerospace Manufacturing. The Viperjet is an all composite two passenger jet airplane with a cruise speed of mach .7 and a max speed of mach .9. The CV5800 is a stretched and zero-timed Convair 580. On 15 December 1941 the Aircraft Manufacturing Factory was created on the basis of N 448 Aviation Engine's Manufacturing Plant, where two plants, G. Dimitrov N31 Aviation Factory of Taganrog and N45 Aircraft Repairing Plant of Sevastopol were evacuated during World War II. Musical Instruments' Plant and Iron Foundry of Tbilisi were joined to Aircraft Plant to ensure a large-scale production of aircrafts, however, after the war these two plants again became independent industrial units. Enterprise "passed the examination" of the most difficult time with enviable indicators, for which it was awarded Order of Red Star In 1945. Professionalism of the staff has been many times appreciated by different state awards. In November 1941 Factory produced its first fighter LAGG-3, serial production of which began in 1942. During World War II, Tbilisi Aviation Factory was the only enterprise providing Transcaucasian and Northern Caucasian fronts with fighters. From 1942 the Factory has been systematically producing new-type models of fighters LA-5 and YAK-3. Bodies of 82 mm mortals, barrels of PPSH sub-machine-gun, flying radio-guided targets LA-17 and anti-ship supersonic winged missiles K-10. In 1946 the first jet fighter in USSR, YAK-15 was constructed in the enterprise, which was followed by YAK-17, YAK-23 and two-seater training jet aircraft YAK-17UTI. In 1952-57 years the Factory was producing MIG-15 and MIG-17 jet fighters. From 1957 were produced supersonic jet fighters MIG-21, two-seater training aircraft MIG-21U, and its modifications MIG-21US and MIG-21UM. In 1962 construction of high capacity assembling building of the Factory was accomplished. In 1971 the design office of the Production Qssociation named afte Souhoy began to develop an armouredjet aircraft for military aims. The First experimental flight of SU-25 look place in february 1975. In march 1979 the first serial plane, pilotted by VIlyushin and prodused at Tbilisi aircraft plant, went up in to the skv. In NATO it be came known as FROGFOOT. In 1979 the enterprise began a serial production of attack aircraft SU-25 and in 1980 production of "air-to-air" guided missiles R-60 and R-73 has begun. Trainers and latest versions of Su-25 are built at Ulan-Ude plant (Siberia). The original Su-25 line in Tbilisi, Georgia ended up being abroad after disintegration of the Soviet Union. The Aviation Factory was equipping former USSR air and naval forces with its output. MIG-21U, MIG-21US and MIG-21UM were exported to Algeria, Bulgaria, Egypt, Finland, Germany, India, Syria and Vietnam. 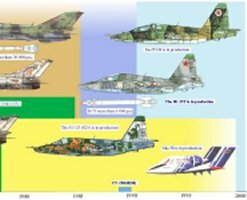 SU-25 and SU-25K were sold not only in USSR, but also in Angola, Bulgaria, Czechoslovakia, Iraq and Northern Korea. In 1987-96 years TAM was producing SU-25T anti-tank modification, SU-25BM, six-seater light civil aircraft YAK-58 for local needs and two-seater training modification SU-25UB.